I had the pleasure of marching by Plymouth Rock today during the annual Thanksgiving Parade. It is a tremendous event and one of those occasions that makes you proud to live in a place with such a remarkable history. It is something of a miracle that Plymouth Colony succeeded. There were more than a few ways that the entire endeavor might have resulted in catastrophe. The key to their survival, I think, was good leadership. The venture was fortunate enough to have several intelligent and stalwart men in charge making careful decisions. The diplomatic and exceedingly clever Edward Winslow, for instance, who became, in essence, the colony’s ambassador to the Native Americans. William Bradford, who seemed to have a natural talent for politics despite his bucolic upbringing. Even the hot-headed and sometimes brutal Standish…as Bradford said of his tactics, “we leave him to answer for himselfe,”…but without Standish’s military experience, the Pilgrims never would have been able to defend themselves. How strange to think that a near tragedy almost decapitated the leadership of Plymouth Colony just as the settlers reached the shores of New England. The Mayflower made land at what is now Provincetown, Massachusetts on November 11, 1620. The settlers spent nearly a month exploring Cape Cod, searching for a place suitable for settlement. These expeditions were made using the shallop, a singled-masted boat of fairly substantial size that had been brought in pieces on board the Mayflower. 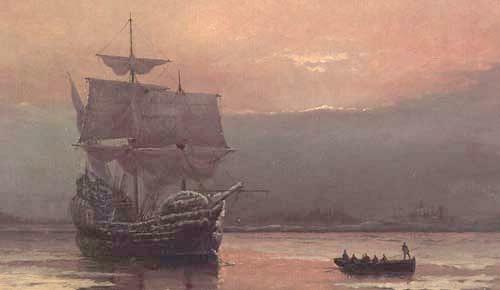 On December 6, the shallop set out from the Mayflower with 16 men aboard. These included six mariners from the Mayflower‘s crew, men whose job it was to transport the Pilgrims to New England and who looked forward to getting back to old England as soon as possible. Some of these mariners, like Robert Coppin, had been to the coast of New England before on fishing expeditions. Also in the shallop were ten of the settlers including Governor John Carver, William Bradford, Edward Winslow and Myles Standish. After exploring what is now Wellfleet Bay and Barnstable Harbor and engaging in a skirmish with a group of Nausets, the party began to fear that they would not find a decent harbor in which to plant their colony. Robert Coppin, however, remembered these waters and informed them that there was a good, large harbor not far away. And so they sailed in the direction he instructed. Not long after they got underway, it began to snow and the wind picked up. Soon, the sea grew so rough that their rudder broke and two of the sailors struggled to steer using oars. As the men began to despair, Coppin suddenly called out that he saw the harbor and urged them to keep their courage up. But the sun was setting and as they neared what is now Manomet, the storm increased. Barely able to maneuver, they could not react to changing gusts of wind and their mast shattered into three pieces. Now the party rowed, tossed by a violent sea. It was almost dark. Now they were caught in a storm in the dark, rudder and mast broken, utterly lost, without even the vaguest knowledge of a safe place to land. The man in charge of this disaster was John Clark, first mate of the Mayflower. And at this point he ordered them to do what he deemed the most sensible thing: he let the shallop run before the wind and hoped to quickly make land wherever they might be cast. Through the dim light, they saw a “cove full of breakers” ahead which some have suggested was Warren Cove, just south of Plymouth Bay. The breakers indicated rocks. In that moment, the key leaders of Plymouth Colony were just moments away from being hurled against a rocky shoal and drowned. Clark must have been confused and paralyzed not to recognize this danger. Now here was a man who, in the midst of chaos, had his wits about him and saved them all. It must have been a mighty hard pull, rowing against the wind, but they turned the shallop around, made it into Plymouth Bay and washed up on the sandy shore of Clark’s Island (ironically named for John Clark who nearly got them all killed). I don’t think there will ever be such a memorial. But I do tend to agree with Gershom Bradford and think it is not too much of an exaggeration to say that the unknown mariner saved the colony from disaster and possible failure. So, when you’re enjoying your turkey on Thanksgiving, remember that unknown mariner. Without his quick thinking, there likely would not have been a Thanksgiving at all. Sources: Gershom Bradford, In With the Sea Wind (1962); Nathaniel Philbrick, Mayflower (2006); William Bradford, Of Plymouth Plantation (Random House, 1981 edition).